Postcards are the perfect way for your customers to make a point quickly and effectively. They can be sent out en masse as a business marketing tool, or they can be sent to friends and family for fun. Because postcards do not require an envelope, they are often the ideal choice for customers on a tight budget. Many postcards feature unique images, designs, or photographs, which allows them to double as both promotional materials and as keepsakes for the receiver. At Color FX Web, we provide premiere digital postcard printing at affordable rates so that you can provide your buyers with a truly exceptional finished product. We are pleased to offer high-quality postcards that can be used to make a high-impact impression throughout a wide range of applications. Our rectangular postcards are printed on 125# 14pt. gloss cover stock with full bleed, or feel free to select 140# 16pt. stock if you prefer. Choose from many different card sizes, fonts, colors, and designs, and please get in touch if you have a specific custom vision to fulfill. 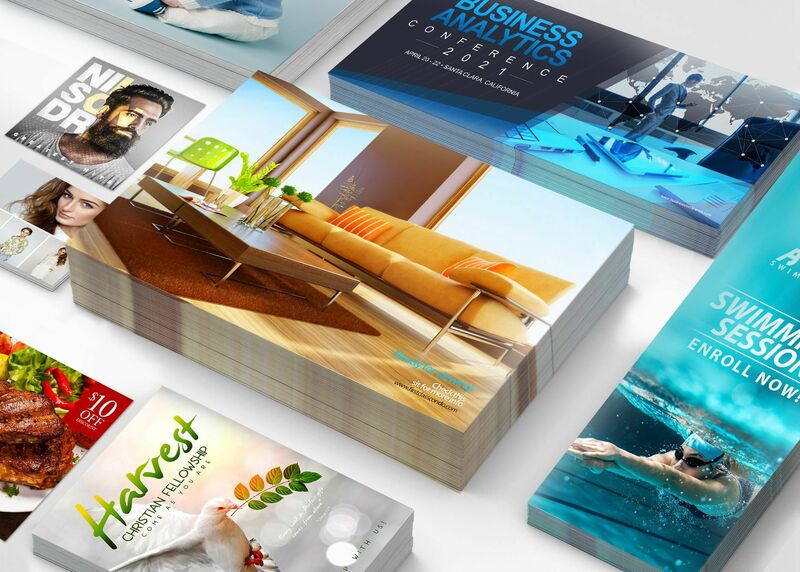 Our digital postcard printing experts have the technical skills and experience to create virtually any type of postcard you can imagine, allowing you to provide your customers with the best possible results. Are Our Postcards Right For Your Needs? Color FX Web is the go-to choice for anyone who needs to complete a large printing job from a trusted wholesale supplier. We specialize in wholesale printing for print resellers that include advertisers, print brokers, graphic designers, and marketing agencies. If you’re not sure if our postcards are the right choice for your customers, just give us a call and one of our experts will be happy to discuss your needs. The beauty of digital postcard printing is that it is a very versatile marketing option with universal appeal. If your customers want to reach a lot of people without breaking the budget, postcards are an excellent choice. Why Choose Color FX Web? Most companies claim to put the customer first, but at Color FX Web we are genuinely and unwaveringly committed to your complete satisfaction. From the initial inquiry until the project has been successfully completed, we provide one-on-one support as needed. Unlike many automated printing companies, you will always speak to a real person, which drastically reduces mistakes, downtime, and redundancies. We use the latest cutting-edge printing technology to produce materials that you can be proud to offer to your customers and clients. We understand that deadlines are critical, and we work with you to find a time frame that you can depend on. We provide so much more than just high-quality digital postcard printing at a low price; we give you reliable expert support every step of the way. We make ordering large quantities of exceptional postcards easy and convenient. Simply pick up the phone and give us a call at (877) 763-7671 to talk to one of our friendly and knowledgeable employees. You can also feel free to shoot us an email at info@colorfxinc.com, or connect with us through any of the major social media outlets. If you’re ready to get started, go ahead and register on our site. Mailing Services fee for Post Cards: List processing fee of $45 for one list and $15 for each additional list, $79 per 1000 Inkjet charge and a postage fee (refer to our Direct Mailing section for details). Size: Minimum of 3.5 x 5.5 and a Maximum of 6 x 11. Design: Must include a 4" wide x 2" tall unprinted area in bottom right corner of mailing panel. 4.25 x 6: 14pt C1S: 2,500 qty. - 2,500 per box - 1 boxes @ 30lbs. = TOTAL weight of 30lbs.